The Crediton Community Bookshop creates a pop-up festival bookshop especially for festival-goers again this year. Here you can explore the extensive supply of festival authors’ publications, purchase your spring and summer reading, or just enjoy a gentle browse. Crediton Community Bookshop is the only independent community-owned bookshop in the Mid-Devon and Exeter area. 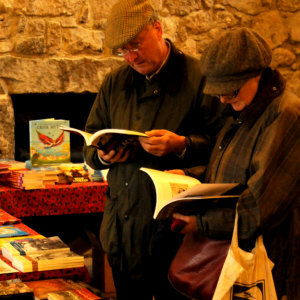 They have been the festival’s bookseller partner, for the 2013, 2015 and 2017 festivals, and we are delighted that they are working with us again for Chagword 2019. The pop-up bookshop can be found in Endecott House, opposite St Michael’s Church. Also in Endecott House, and just a short walk from the Jubilee Hall, is the pop-up Festival Café. Festival-going can be an exhausting pastime so if you are in need of a little refuelling this is the perfect place to rest and relax. For detailed information on all the many delights Chagford has to offer the festival visitor, go to www.visitchagford.co.uk.